Laying on my chaise lounge on an empty beach, feeling the sun warm me inside out and being lulled into peaceful moments by the waves. Reading on the beach, sleeping on the beach, eating on the beach. LOL! I also love BBQs with friends and sitting outside at night with candles lit, sipping a glass of wine. *sigh* Is it summer yet? Watching the fireflies at dusk with my kids. It never gets old! rock climbing, kayaking, swimming with my baby girl, hiking with her daddy, reading a good book in the shade, cookouts with the family, enjoying a good thunderstorm, and falling asleep to the sound of my hubby playing his guitar. Right across the street from me is the St. Johns River. I like to catch glimpses of it sunrise. P.S. I love fireflies too, though we haven't seen many lately :( Maybe it's not quite warm enough yet. Picnics, walks, lying in the grass, going to the beach, reading, drawing/painting, hanging out with friends, and video games on the really hot, sticky days. And on those rare occasions when it's warm out, pouring rain, and no thunder or lightning, I like to go for a walk in it. And barefoot if it's safe to do so. Although I don't have fireflies or sweet tea, you've totally put me in the mood for summer. I love all of the above plus the beach, watching my children enjoy the swimming pool, free to read for long stretches at a time. Reading, playing at parks with the kids,and taking the kids on hikes. Going to my dad's place in the mountains, reading by the pool and feeling so in tune with God! No distractions, no stress. Mine are not so lazy as I work year 'round, but on the weekends, I like to stroll down the causeway on the beach and walk my dog. Then go eat an ice cream cone. :) Or just hang out and read a book. Or get together with friends, or......good grief! Sitting on my porch with my hubby. Going to the pool with the kids. Making wedding soup. Camping. Reading. Sitting outside at the coffee shop. I agree with novels and water! Also, staying up late and sleeping in late! Diane, What's the opposite of green? Does green have an opposite? That's the color of my thumb. Jennifer, And doesn't laughter sound that much better outside? Lydia, True. True. It will never get old. Kathy, Just something about the sun on the water. Beth, A huge congrats for honorable mention over on Rachelle's blog this past Monday! Alyssa, Thanks for representing last night. Barefoot. I am hardly ever in shoes this time of year. My husband laughs at the example I set for my kiddos. T. Anne, Ahhh. Summer. Am looking forward to some great reads this summer. Did you start Catching Fire yet? My neighbor has it for me to borrow when I'm ready. Patti, Those evening walks are so relaxing. Diane, Your a winter bird, huh? Not so much for me. Oh Karen, You remind me that our dog has become the red-headed stepchild since we've birthed three children. Poor Samoyed doesn't get walked enough. Terri, Can't wait to hit the beach. Thank you for your deeply encouraging email today. You moved me!!! Susan, Love connecting through comments. Wedding soup. Not sure I've had it. Is that the one with many types of beans? I'm intrigued. Well folks. You complete me. Only kidding, but you sure make me smile. Dream of fireflies and not ants. BBQ's with friends, gardening, reading, taking rides in the country, antiquing, and yard saling are my favorite ways to decompress. 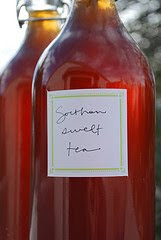 I was just thinking about sweet, summer tea. And, my favs? Summer lightning storms that move through quickly, but with some drama. I don't think I can top your list, so I'm just stealing yours. And I LOVE that picture of the sweet tea! Sleep late and sleep early! You know, last night the hubby and I sat together on our back porch. The children were in bed, the pup was chewing on a stick in the backyard and there was just enough of a breeze to keep us cool. Life doesn't get much better than that!